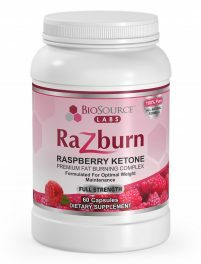 Razburn combines the potent, all-natural fat-cutting properties of Raspberry Ketone, with the appetite suppressing qualities of African Mango, and the super-antioxidant power of Acai, Green Tea, and Resveratrol. The combination of these proven ingredients is what makes Razburn the SUPERIOR choice for highly effective weight loss. Recommended Usage: Razburn is most effective when used with a responsible diet. We recommend using Razburn during the Complex Diet Drops protocol to aid in suppressing hunger, enhancing fat loss, and increasing energy. Razburn is an ideal option to help maintain a healthy weight once the diet protocol is completed.